The Avery Weigh-tronix DW drum scale is a multipurpose low profile floor scale which allows wheeled bins and drums to be easily pushed on and off. This 1,000 lbs capacity platform scale is also strong enough to support pallets loaded from the side onto the rails of the scale. Painted Steel or Stainless Steel choice. The Avery Weigh-tronix DW drum scale is a multipurpose low profile floor scale which allows wheeled bins and drums to be easily pushed on and off. This 1,000 lbs capacity platform scale is also strong enough to support pallets loaded from the side onto the rails of the scale. The DW Series is the high grade powder paint finish carbon steel version of the Drum Weigher Scale. The live weighing area is 30" X 30" and has a tread plate surface for improved safety and durability. The side rails are live and useful in weighing products that extend beyond the weighing area. The standard product includes two access ramps and a 25' interface cable or a 6' interface cable when ordered with an indicator post. The highest elevation of the weighing platform is 1½" from ground surface. A gasketed junction box sums the four Weigh Bar® weight sensors and provides a quick interface cable termination. The Drum Weigher is Factory Mutual System approved with the GSE 350 I.S. or GSE 355 I.S. indicator. It has 100% end loading capability. The DWS Series is the stainless steel version of the Drum Weigher Scale. The live weighing area is 30" X 30" and has a tread plate surface for improved safety and durability. 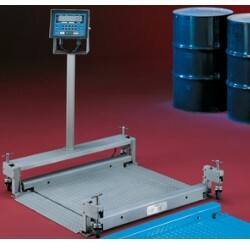 The side rails are live and useful in weighing products that extend beyond the weighing area. The standard product includes two access ramps and a 25' interface cable or a 6' interface cable when ordered with an indicator post. The highest elevation of the weighing platform is 1½" from ground surface. A gasketed junction box sums the four Weigh Bar weight sensors and provides a quick interface cable termination. The Drum Weigher is Factory Mutual System approved with the GSE 350 I.S. or GSE 355 I.S. indicator. It has 100% end loading capability.